The stunning Rolls Royce Ghost Series II is launched in the country's automobile market in two variants. Out of these, Rolls Royce Ghost Series II Extended Wheelbase is the top end trim that has received many modifications to its interiors. These include the revised front and rear seats with electronically adjustable thigh support at front. It also features an advanced music system that has a 10-inch multimedia screen. Besides these, it has the satellite aided navigation system, new car user interface, revised instrument dials as well as a clock in the cabin. In terms of exteriors, it has the LED headlight cluster in rectangular shape that are framed by daytime running lights. The bonnet is modified, which looks attractive with the 'the spirit of ecstasy' on it. This includes a waft line as well that leans forward, while the re-sculptured bumpers offers this vehicle a dynamic appearance. The company has incorporated it with a 6.6 litre petrol power plant, which can displace 6592cc. It is skillfully coupled with an 8-speed automatic transmission gear box. It has a large fuel tank that carries around 82.5 litres of fuel in it. This luxury saloon is bestowed with a disc braking mechanism, which is quite reliable. In terms of safety, it includes ABS with EBD, security alarm system and a few other features that helps in safeguarding the vehicle and its passengers as well. This saloon has an eye catching outer appearance that will certainly lure several buyers. To begin with the rear end, it has chrome exhaust finishers on either side of the rear bumper. There is an expressive boot lid, which is flanked by well designed tail lamps. The windshield is wide, which features a high mount stop lamp and a defogger as well. The front fascia looks striking with a well sculpted bumper that is fitted with an air intake section for cooling the engine quickly. It has a large radiator grille that includes vertically positioned slats and treated with a lot of chrome. There are a couple of wipers fitted to its wide windscreen, while the newly designed bonnet features a waft line that leans further forward. It also has the rectangular shaped LED headlight cluster that is framed by day time running lights. The 'spirit of ecstasy' on its sleek bonnet is another features that adds to the look of its frontage. On the other hand, its side profile includes aspects like chrome door handles, window sill as well as outside rear view mirrors. Its neatly carved wheel arches are fitted with a stylish set of 19 inch alloy wheels that are equipped with run flat tyres of size 255/50 R19. This vehicle comes with an overall length, width and a total height of 5569mm, 1948mm and 1550mm respectively. The wheelbase of 3465mm is quite good and indicates to ample leg room inside the cabin. This Rolls Royce Ghost Series II Extended Wheelbase trim is blessed with spacious interiors that is packed with a number of advanced features. It has an elegantly designed dashboard that is integrated with equipments like a stylish center console, air vents, newly designed instrument cluster, glove box and a steering wheel, which is wrapped with leather. The chrome plating on inside door handles and wood finishing on the dashboard further gives it a classy appearance. There are lounge seats incorporated, which are pretty wide and well cushioned as well. There is enough shoulder space offered to its passengers along with sufficient leg as well as head room. The revised front and rear seats have headrests and these are covered with premium leather upholstery. There is electrically adjustable thigh support facility available to the front seats, while the rear ones are also slightly modified. Moreover, it is available with seat massage and ventilation facility as optional features. It is offered with a boot space of 490 litres, which is good enough for storing a lot of luggage. This top end variant is powered by a twin turbo 6.6-litre petrol motor that carries 12 cylinders and 48 valves. It comes with the displacement capacity of 6592cc and integrated with a direct injection fuel supply system. The manufacturer has paired this mill with an efficient eight speed automatic transmission gear box that helps in smooth gear shifts. It has the ability to produce a maximum power of 563bhp at 5250rpm and generates a peak torque output of 780Nm at 1500rpm, which is quite impressive. This saloon is capable of achieving a top speed of 250 Kmph and consumes around 5.0 seconds to cross the speed mark of 100 Kmph, which is rather good. The maximum mileage delivered by this mill is around 10.2 Kmpl on the bigger roads and it returns nearly 4.71 when driven within the city. The automaker has offered it with a proficient suspension system, which keeps it well balanced irrespective of the road conditions. The front as well as rear axle have air suspension system along with variable damping control. Meanwhile, it has a reliable braking system, wherein its front and rear wheels are fitted with ventilated disc brakes. This is further assisted by anti lock braking system along with electronic brake force distribution. On the other hand, its rack and pinion based steering system with speed sensitive variable rate power assistance helps in easy handling. This system supports a minimum turning radius of 14 meters. This variant is blessed with a long list of comfort aspects that gives an enjoyable driving experience to its occupants. It has all four power operated windows, while there are electrically adjustable external mirrors with heating function. It includes an advanced automatic air conditioning unit that comes along with a heater and pollen filter as well. Moreover, it has cameras present in both front and side indicators that helps the driver to maneuver it easily. Other aspects like power assisted steering system, rain sensing wipers, adaptive headlamps, electronic driver assistance system, rear privacy glass and a few other such features are available that adds to their convenience. 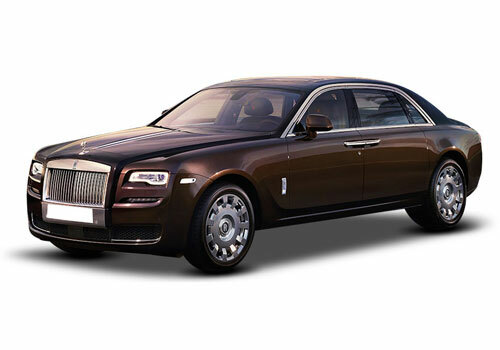 The manufacturer has loaded this Rolls Royce Ghost Series II Extended Wheelbase variant with various safety features that ensures protection of its passengers and the vehicle as well. These include dual front airbags, side impact beams, engine immobilizer, high mount stop lamp, central locking system, anti lock braking system along with electronic brake force distribution and a few others in the list. 1. Availability of many comfort features. 2. Acceleration and pickup is quite impressive. Rolls Royce Ghost is available in 16 different colours - White Sands, ANTHRACITE, Dark Emerald, Scala Red, English White, Midnight Sapphire, Salamanca Blue, Smoky Quartz, Arctic White, Jubilee Silver, Silver, Black Diamond, Iguazu-Blue, Darkest Tungsten, Bohemian Red, Petra Gold.